What’s inside a Japanese good luck charm? If you have visited Japan, you might have gotten at least one lucky charm or omamori from shrines or temples. They are usually small bags, smaller than a business card, made out woven cloth. The purpose of charms depends on what you want or where you bought them. For example, if you are a student and will have an important exam, you want Goukaku-Kigan Omamori. If you are pregnant and expecting a baby in six months, you want Anzan-Kigan Omamori. If you own a business, you want Syoubai-Hanjo Omamori. 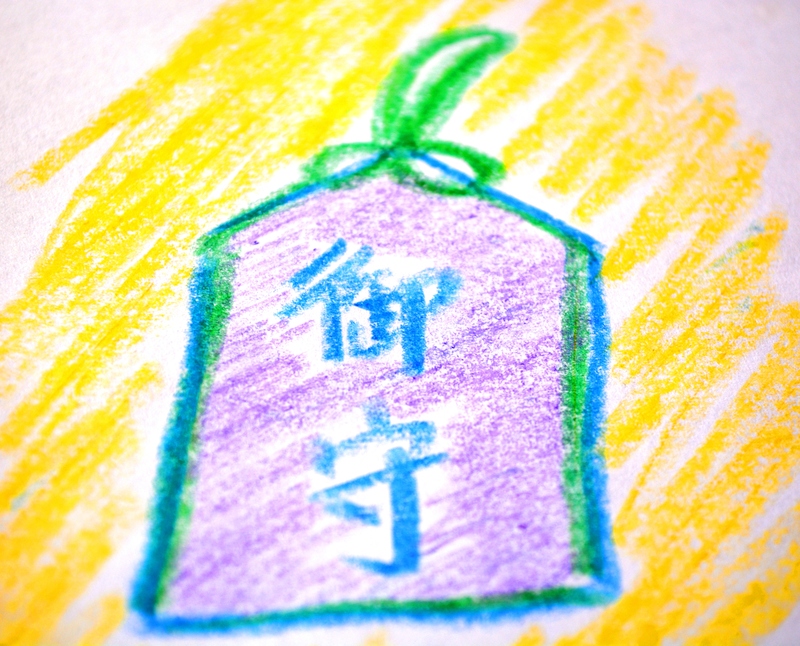 Any hope can be matches with an omamori! When I was in elementary school, one of my friends told me that if you open a lucky charm intentionally, gods will leave it and you will never get any rewards. You might even be cursed! I was frightened and decided that I would not open my lucky charm at any cost. Unfortunately, I was a typical curious and mischievous boy who did anything, especially when someone said NOT to do so. My lucky charm was safely hanging from the outside of my school bag. The first two or three days, I was able to behave myself. But after that, I couldn’t resist opening my lucky charm. It’s really me who is writing this story so I wasn’t cursed or punished but I’m sure you want to know exactly what I saw when I opened my charm. But if you are curious enough to take a risk, be my guest! Open up your good luck charm and see what’s inside. If you have visited any Japanese shrines, you might have noticed that they all have almost the same structure. They mainly consist of two buildings. In front there is a building called Haiden. This means the place people pray. Behind, there is an another building called Honden. This means the main building or God’s place. It’s usually separated or gated so the public has no access. People pray at the Hiaden area and leave. You can’t go or see into the Honden, except for special exhibitions or occasions. If you want to see inside, you have to break into the Haiden, go through it, and cross a bridge to the main building. If you get this far without getting caught or struck down by the gods, you may have to break the door to get inside the back building. But this would be bad and is not recommended. Now you are curious what’s inside Honden, the main building of a shrine. Some popular shrines or famous places have special exhibition days called Gokaityou. You can see interesting objects like precious old statues or paintings. Unfortunately, some places will never be open to the public. If you could see what’s inside those unveiled shrines, you would get something more than a surprise! Actually, there is one way to see. Become a monk! The idea of a lucky charm is to carry the value of a shrine with you. Your charm is like a portable shrine so opening your charm is equivalent to breaking into the god’s building at a shrine without permission. You are not supposed to open your lucky charm but most of the time, generous Japanese gods are not going to punish you if you do. At least from my experience, so far, but don’t do what I did! Next time I will open it up and put it on the kitchen table for you to see. Hee hee hee! Oh that’s very interesting to know ! I’m not going to tell what’s inside! Haha ! I have one question, a bit out of the subject. My friend is going to Japan in April, and she asked me what she should bring back as souvenirs. What do you think is typical ? Are good luck charms very typical in souvenirs shops ? Is it common to bring back that to the family or friends ? I am sorry for not responding sooner! Yes, it’s common to give lucky charms to your friends. You can only buy them at shrines and temples though. When my wife got pregnant, my sister and her friend bought her healthy baby charms from different shrines. Hilary here! (It’s a team effort. :D) Major tourist attraction shrines usually have the good luck charm meaning translated somewhere, usually on a piece of paper beside the demonstrations charms. Shrines that aren’t as touristy won’t but it’s possible that someone there or another guest may speak a language your friend does and can help out. One of my favorite conversations with my husband, Hitoshi is hearing how he grew up. What he experienced, the stories he was told, the festivals and celebrations he attended, and what is was like to be part of a multi-generational household are captivating for me. I also love collecting Japanese good luck charms and even though Hitoshi has encouraged me to open one to see what is inside, I never will. Here is a story he wrote on his blog, gozumezu.wordpress.com about his own experience with wanting to open charms despite being warned not to! Well, I was never curious before, but now I am! I really thought you were going to tell us, but had to laugh when you said we have to open one ourselves. Maybe I will, but maybe I won’t! My protective charm was accidentally washed when I forgot to take it out of my pockets when I washed my pants , and I read online that the contents are usually paper with protective things printed onto it , so , given that , would the charm still apply to me ? Probably you could go back to the shrine or temple you got it and replace to a new one. I was wondering what counted as opening an omamori? Does it only count if you take off the seal (rope part) and open it? Or does it count if you just squeeze it a little and there’s an opening on the side? Taking off the seal is considered as opened but squeeze……that’s considered as bad as well in other ways. Ah I didn’t know and I got really curious…I didn’t take off the seal but I did squeeze it a little and I saw the top of what’s inside but I didn’t see the writing…does that mean my omamori is not the way it should be anymore? If you are worried I’d take it to a shrine and get a new one..I think the important thing is how you feel! i loose the back knot and peek inside. did not take out anythings and tie it back. so will i get bad luck? and blessing gone? Probably nothing’s gonna happen but your good luck charm became now just a charm. If something bad happens now on, that’s not because you saw the inside and vice versa!